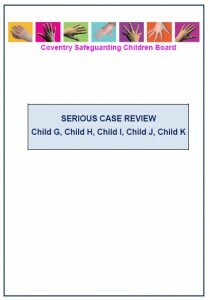 COVENTRY, UK: 11th July 2016: A project worker from local charity KairosWWT has been praised for her professionalism in a serious case review (SCR) carried out to investigate the background to the child sexual exploitation of five young people in Coventry in 2012. Published today, the SCR outlines how the five young people experienced violence, intimidation and sexual exploitation over a considerable period of time, and focuses on what can be learned in order to improve Coventry’s response to young people at risk of CSE. The SCR acknowledges that the work carried out by a group of voluntary sector organisations – KairosWWT, The Children’s Society, CRASAC and COMBAT – was instrumental in recognising that CSE was taking place and that they began the collection of relevant data which was passed onto the Police PPU for action. The Local Safeguarding Children’s Board should share the SCR with the Adult Safeguarding Board and review options for joint working or commissioning of services for the victims of CSE. ‘This report highlights again how important it is to listen to young people and value their voices. I strongly believe in a relationship based model and advocate its use to underpin the practice of all professionals working in the field of CSE’. ‘We are pleased that the SCR has recognised the expertise of the voluntary sector and commend our worker for her professionalism. We also welcome the acknowledgement that multi-agency responses must include everyone who has contacts with young people at risk of CSE and we look forward to future collaborative working with the statutory sector.